The western province had a disappointing season under Keane’s tutelage and have now begun the search for a new head coach. Keane only arrived in Galway last summer. 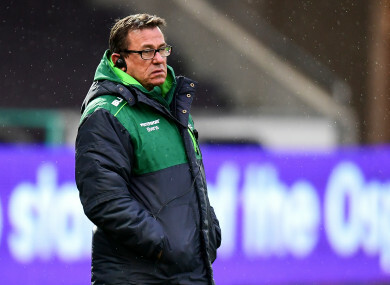 THE DECISION TO fire Kieran Keane as Connacht head coach was made well in advance of Saturday’s record 47-10 win over Leinster in the province’s final game of a dismal season. Connacht have parted ways with the Kiwi just 12 months into a three-year contract, in news first reported by Brendan Fanning of the Irish Independent last night. While a Connacht spokesperson declined to comment when contacted by The42, it is understood that Keane’s coaching team, including backs coach Nigel Carolan, forwards coach Jimmy Duffy and defence coach Peter Wilkins, who were all appointed on two-year deals last summer, will not be impacted by the 64-year-old’s dismissal. Keane’s fate was sealed long before a disappointing season came to a conclusion, with his lack of integration with local clubs and supporters proving a factor, while players were disillusioned with a lack of clarity in his direction. Connacht had a disappointing and frustratingly inconsistent season under Keane’s tutelage, winning just seven games in the Pro14 and finishing above only Zebre in Conference A, while their Challenge Cup campaign ended at the hands of Gloucester at the quarter-final stage. Described as the ‘perfect fit’ to succeed Pat Lam by Connacht CEO Willie Ruane last summer, Keane moved to Galway from the Chiefs and brought an impressive coaching CV to the job after previous roles with the Highlanders and Tasman Makos. Keane spoke after Saturday’s game of the one-to-one reviews which were going to be held in the coming weeks as a ‘robust review’ took place to plan for next year. “We’re going to have a big review and sit down,” he said. “I think there was a little bit of lip service paid to it last year, mainly because of coaches going and different personnel coming in. “We’re going to have a very robust review about everything. In terms of coaching, in terms of the way we play, the players are going to get an opportunity to have one on ones and (talk about the) way forward. But the first one-to-one review was between Keane and chief executive Ruane yesterday and all that remains now is to work out a compensation package for the two years he had to run on his contract. The search for his successor will begin in earnest as Connacht hope to get it right this time. It is understood that the decision to oust Keane was done to give them as much time to find a replacement and get him in place in time for the start of the new season. Keane’s unexpected departure comes after Ulster confirmed the appointment of former Connacht prop Dan McFarland as their next head coach yesterday. Email “Keane's Connacht fate sealed some time ago as Kiwi leaves after just one season”. Feedback on “Keane's Connacht fate sealed some time ago as Kiwi leaves after just one season”.